Aiden Byrne – Special Occasion Coming Up? Do you have a special birthday or anniversary coming up? Are you getting married and looking for that intimate and special location to hold your wedding breakfast? 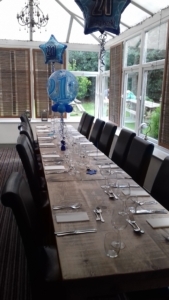 At the Church Green, we can accommodate large party bookings, weddings, funerals and any other private parties in our Conservatory, Lounge and Garden areas. Contact us on 01925 752 068 to discuss your needs.